Wallet-size blackjack strategy cards tailored specifically for each set of rules. Available individually, or in a set of all six. Small credit-card sized charts for easy use at the casino table. Solid plastic for durability, small enough to fit in your wallet. Step 1: Choose the correct strategy card. Determine how many decks are in use at the particular game you are playing. If you are not sure, just ask the dealer. Our strategy cards come in 1 deck, 2 deck and 4/6/8 deck versions. Use the 4/6/8 deck chart for any number of decks over two. For example, some continuous shuffler games use 5 decks of cards. Dealer Hits or Stands on Soft 17? Some casinos offer games where the dealer must stand on all 17s, while others require the dealer to take another card if they have a “soft 17”. The tabletop felt should include wording that says either “Dealer Stands on All 17s” or “Dealer Hits Soft 17”. Use this information to choose the correct strategy card. What is a soft 17? 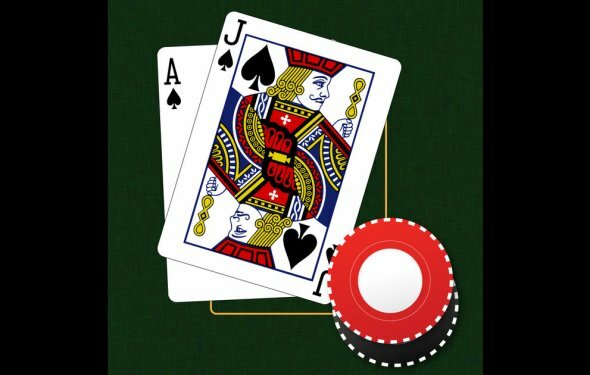 A “soft” hand is a hand that includes an Ace and cannot bust if you take another card. A hand of (Ace, 6) is a soft 17. A hand of (3, Ace, 3) is also a soft 17. However, the hand (3, Ten, Ace, 3) is not a soft 17 even though it includes an Ace. For our example here, we’ll assume you are playing a 2 deck game, and the wording on the table indicates that the dealer hits soft 17. Step 2: Find the row for your hand on the card. Once you’ve chosen the right strategy card, refer to it whenever you encounter a hand for which you are not sure of the best strategy. Each card is split into three major sections. On the front side of the card you’ll find sections for both hard and soft total hands that are not pairs. On the back of the card you’ll find complete advice for playing hands that are pairs.